Time for a Parking Review? Business Profiles – Makes your business stand out? A new, vibrant focal point will complement Hall A1 Timepieces at the 2019 Inhorgenta Munich. An innovative Watch Boutique will be set up in the middle of the hall where exhibitors will showcase new models and collections. 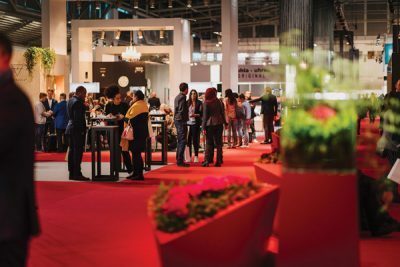 Exhibitors include Alexander Shorokhoff, Ebel, MeisterSinger, Michel Herbelin, Mühle Glashütte, Sinn Spezialuhren, Staudt Watches, and Tutima Glashütte. The already fully booked boutique area, situated in the heart of the Timepieces Hall, invites exhibition visitors to window shop through the world of timepieces on display at Inhorgenta Munich. In an atmosphere of elegant sophistication, visitors will experience the latest on offer from the watch industry. A round table stands in the middle of the Watch Boutique where industry members can meet daily to discuss current developments in the watch industry, especially focusing on best practice applications and current trends. Trade fair goers can visit the adjoining bar with an inviting lounge atmosphere to sit back and relax. Long-standing exhibitors such as Casio, Junghans, or Engelkemper will be joined by many new brands in the Timepieces Hall in February 2019. One such newcomer is the Citizen Group, which, alongside its parent brand Citizen, will present its Swiss brands Frederique Constant and Alpina as well as the American heritage brand Bulova in Munich. Maurice Lacroix is returning after a break of several years with a large exhibition stand, as is Bruno Söhnle. Smartwatch manufacturer Garmin is also new to the trade fair with their own stand. Their exhibit together with Komsa will widely represent the booming smart and connected watches segment. “From the finest quality Swiss mechanical craftsmanship and the widest range of German brands to the latest generation of smart watches: Visitors can find a wide range of products at Inhorgenta Munich, allowing them to assemble their own optimal array of products,” says Klaus Dittrich, Chairman and CEO of Messe München. Three Birmingham City University (BCU) School. Inhorgenta Munich delivers a positive summary. Following recently announced changes to the. Birmingham’s family-favourite Italian restaurant, Cucina Rustica,. Regarded as the founder of the. Following several successful offline events and. Charity ‘Parkinson’s UK’ is inviting local. Inhorgenta Munich will once again be. Birmingham-based trade event, Jewellery & Watch,. Jewellery & Watch Reveals ‘The Studio’. You will only receive a daily digest when new items have been posted. 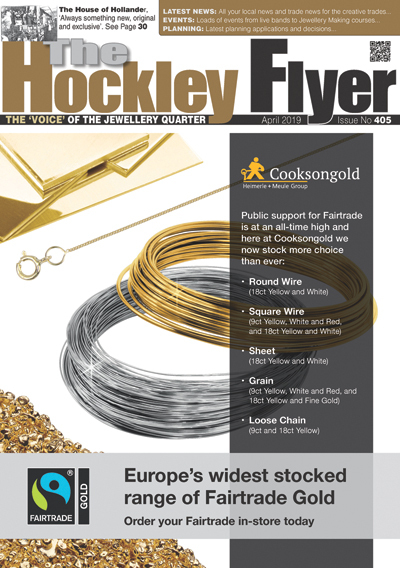 The Hockley Flyer - the magazine for The Jewellery Quarter. © Copyright YBA Publications. 2019. All rights reserved.